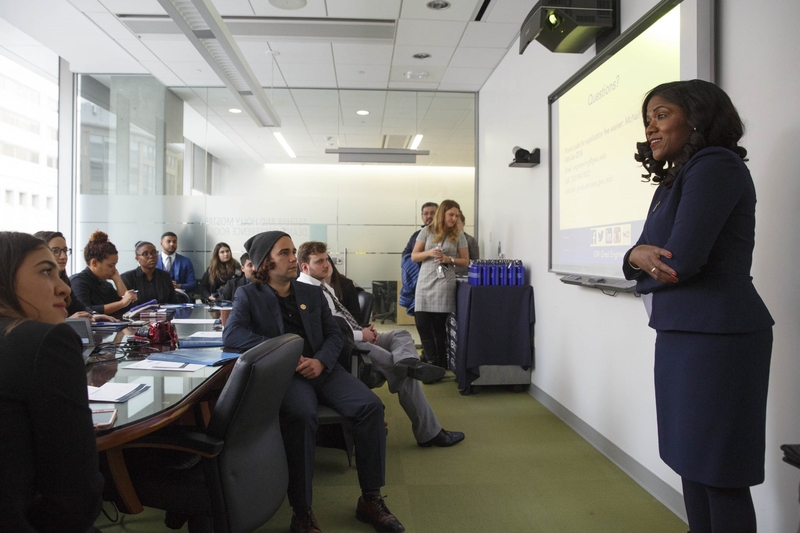 The McNair Scholar cohort from Florida International University (FIU) asked question after question Wednesday about graduate programs at the George Washington University in science, technology, engineering and mathematics. The scholars were eager to know about research and fellowship opportunities at GW. They asked about life as a grad student in Washington, D.C. And they wanted to know about advantages of doing research in the nation’s capital. The group’s visit to GW was part of a national tour that provides the scholars from FIU an opportunity to learn about graduate programs in STEM fields. Named after astronaut and physicist Ronald E. McNair, the McNair Scholars Program was designed to provide opportunity for low-income, first-generation undergraduate students and students from under-represented, disadvantaged backgrounds to pursue post-baccalaureate education. The scholars from FIU focus on STEM fields. Michael Tapscott, director of the Multicultural Student Service Center at GW, said that having McNair Scholars at GW could cultivate an interest in the scholars eventually becoming faculty at GW and role models on campus. He added that a successful visit with the scholars could lead to them discussing GW with other McNair Scholar Programs at the 200 colleges and universities that participate in the program. Scholars were welcomed with remarks from Royce Francis, associate professor with the School of Engineering and Applied Science. The group toured Science and Engineering Hall with graduate biomedical engineering student Shakti Gurikar, learning about the technology being used and research being conducted in some SEH labs. James Perez-Sanchez, a senior physics major at FIU who hopes to get a Ph.D. in medical physics, said that the talk from Dr. Francis helped him to realize how fortunate he is to be a McNair Scholar and how important it is to find your passion within STEM fields. "I'm trying to find, when I go to graduate school, what I’m going to be passionate about…and become a master at that thing and do my tiny little part in changing the world in some way,” Mr. Perez-Sanchez said. “It was really cool it get that insight from him." Valentina Dargam, a senior biomedical engineering major at FIU whose research focuses on the cognitive responses of bilingual people, said she’s interested in the research opportunities she would have pursuing a doctorate at GW. "I like the fact that GW in general is very involved with what's going on here on Capitol Hill," Dargam said, listing National Science Foundation and National Institutes of Health partnerships as examples. "There's a lot of other agencies that you have right here at that palm of your hand just by location and also affiliation."